With its miles of sandy beaches, crystal clear waters and luxurious resorts, the island of Cyprus has traditionally been a favourite holiday destination. According to Takis Kyprianou, founder of DMC Principal Promotions, Cyprus has often been "overlooked" by corporates wanting to avoid swarms of holiday-makers. "Cyprus was perceived purely as a holiday destination, somewhere which wasn't conducive to business," he explains. "Clients tended to opt for other destinations that were more traditional like Berlin or Amsterdam or fly to countries nearer to the UK such as Turkey or Italy." However, Koullitsa Demetriou, senior tourist officer at the Cyprus Convention Bureau, which was launched in January to develop and promote Cyprus' C&I offer, doesn't agree. She describes Cyprus as having "a great reputation" for understanding the needs of event planners. "Cyprus is recognised as having good quality C&I products, both in terms of the facilities available and of the service," Demetriou says. "This island is known for the variety that it offers and the ease with which you can combine business with pleasure." Thanks to Cyprus taking over the EU presidency in July, there has been a surge in refurbishments and redevelopments, including hotel upgrades and new openings such as the Sunrise Pearl Hotel and Spa, regeneration in Larnaca and Limassol, and major reconstructions among some of the most ancient cities. "The EU presidency in Cyprus has made a huge impact on the island's investments and developments," says Demetriou. "With all the changes, the Cyprus Convention Bureau has become a central point of reference for corporates wanting to organise their conferences and incentives." The Limassol Marina project, expected to be completed by the end of 2012, will span a 6,000m2 commercial area, offering elegant boutiques and designer stores, high-end restaurants and several waterfront bars overlooking an estimated 650 yachts. 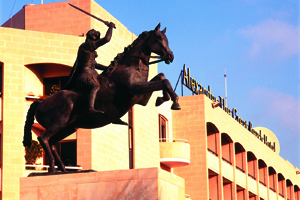 And to the west of Limassol, further along the coast, the 202-room Alexander the Great Hotel in Paphos is undergoing major refurbishments, due to be completed around March 2013. It will feature larger, spacious guest rooms, landscaped gardens and a brand new infinity pool complete with waterfalls and pressure jets. 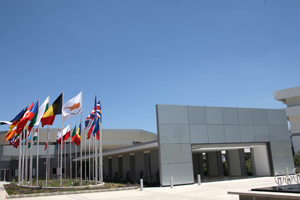 The Nicosia International Conference Centre, the current base for the EU presidency, has also seen a total refurbishment. Featuring the 1,000-capacity Xenon Conference Hall - its largest space - with a 150-seat auditoria, more than 300 workstations, two suites of six briefing rooms and two specialist delegate suites, the centre is equipped with the latest technology and catering facilities. However, while the EU Presidency has led to fresh investment, it may not see an immediate boost in C&I business. OM Destination Management owner Stavros Kleovoulou has noticed a drop in UK business throughout the recession, with those booking giving shorter lead times. He says: "Corporate clients have given us very short notice lately. In August I received a request for October - traditionally a good month to find rooms - but because of the EU Presidency we have lost three to four popular meeting places, and with those hotels full the overflow hotels become full too, so it is difficult to find rooms at short notice." Longer-term, however, there is optimism about the impact the recent developments will have. Due to the level of investment in Cyprus and the mix of sun, natural beauty and culture, Artemis Kasapi, founder of UK-based Cyprus events agency Artkas, believes that corporates considering it won't be disappointed. There are plenty of opportunities for incentives, in addition to low VAT rates, excellent conference facilities and a good exchange rate. "Cyprus is a great place to come whatever the size of your company," she says. One of Principal Promotions' UK-based clients, a global IT services company, has been particularly taken with the island. "The company has been to Cyprus for three executive years for its annual sales incentives," Kyprianou says. "There is so much to offer and we are never short of suggestions as to what the delegates can do. It has created great momentum among its teams and they are intending to return again later in the year."